Construction workers working on an apartment complex in Kuala Lumpur. CIMB Research says execution is now the order of the day for the construction industry. PETALING JAYA: More than a year after the local construction industry was hit by deferred projects coupled with high material costs, its prospects appear to be on the mend, say industry players. “We can definitely look forward to better times, especially with cheaper material prices now,” Malaysian Resources Corp Bhd (MRCB) group managing director Shahril Ridza Ridzuan told StarBiz. Shahril said he believed the Government would be “efficient” in rolling out projects under the 9th Malaysia Plan (9MP) and stimulus packages which were key to the survival of the sector. MRCB’s ongoing projects were “going well”, he said, adding that the company, largely involved in construction and property, had several projects under tender of which “one or two” fell under the RM67bil stimulus packages. Its current construction order book stands at close to RM3bil. Last year was a difficult one for the construction industry with the change in government in certain states which subsequently thwarted certain infrastructure plans. Coupled with the surge in prices of materials like steel, which peaked at RM4,000 per tonne and crude oil which hit a record of US$147 per barrel, many construction companies were struggling to keep margins afloat. Steel prices have since softened to around RM2,000 per tonne last month while crude oil is about US$60 per barrel now, translating possibly into healthier margins for the players. A clearer political direction is also apparent under the administration of new Prime Minister Datuk Seri Najib Tun Razak. 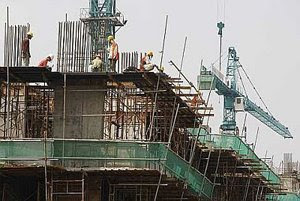 “Execution is now the order of the day,” CIMB Research told clients in a recent construction sector update. “We believe things are getting better but we urge the Government to be ‘quicker’ in the implementation of more of the announced projects,” Prinsiptek Corp Bhd managing director Datuk Foo Chu Jong said. The smallish construction company which has an order book of about RM400mil to RM500mil was “in discussions” with the relevant parties on several infrastructure projects and hoped to secure “some soon”, he said without elaborating. In its update, CIMB Research identified 12 mega construction projects worth up to RM80bil, of which RM30bil to RM35bil was for the Klang Valley light trail transit extension and upgrade project, also known as the “highlight” project of the government’s pump-priming over the remaining 9MP period. It identified MRCB, IJM Corp Bhd, Gamuda Bhd, UEM Builders Bhd and WCT Bhd as potential winners of this huge project, citing their cost efficient measures and track record. The Bakun power transmission project is another mega project to look out for with CIMB saying that the project may take off “sooner than later” as cost had come off from RM14bil to RM9bil on lower steel prices. MRCB was at the forefront for this project given its experience in undertaking major power transmission in the country, it said. Najib said early this month that as at June 19, RM9bil worth of projects had been awarded under the Government’s RM67bil stimulus packages to stimulate economic growth. Of this, RM3bil had been disbursed. KELANA JAYA: Glomac Bhd hopes to sell at least half of the RM400mil worth of properties offered under its current property campaign that ends this month, amid signs of a pick-up in demand for medium-price houses, said group managing director/chief executive officer Datuk FD Iskandar Mohamed Mansor. Glomac was offering “everything” from 11 property developments, from medium-price houses to high-end condominiums and commercial properties in its 21st Anniversary Property Campaign, he said. “We are turning 21 this year, so we want to celebrate our achievement by giving 21 great rewards to our customers,” Iskandar told StarBiz during an interview recently, referring to freebies such as free kitchen appliances. “Some of the properties have just been launched such as Seri Bangi and Glomac Damansara,” he said. He added that given the current market conditions, the company needed to be realistic on sales targets and property launches. “We have six new property projects to launch this year apart from 13 or 14 ongoing projects. Another three new commercial projects are being planned and will be launched when the market improves,” he said. The company’s gross development value for its ongoing projects was RM2.8bil, which could last the company for a further five to six years, Iskandar said. He noted that Glomac’s gearing ratio was also low at 0.1, and the company would try to contain it below 0.5. KUALA LUMPUR: A passion for putting together hotel transactions around the region has proven to be a boon for Zerin Properties chief executive officer Previndran Singhe. 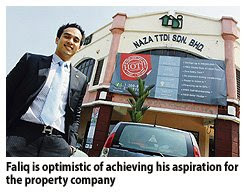 Since opting to specialise in the hotel sector in 2004, his real estate agency has brokered seven deals with total market value of close to RM1bil. The disposal of part of the Sheraton hotel chain in 2005 for RM138mil set the pace. In 2005, the sale of Grand Centrepoint Hotel to Tune Hotel group for RM12.5mil paved the way for the first Tune Hotel in the country. Describing the Tune Hotel deal as his most exciting so far, Previn said the excitement was in doing a deal for a new Malaysian brand and having to convince the buyer that the property was at an ideal location. Located at the corner of Jalan Sultan Ismail and Jalan Tuanku Abdul Rahman in Kuala Lumpur, the hotel has been refurbished and turned into the flagship property of Tune Hotels.com. According to Previn, his most memorable and rewarding deal to date is the sale of Four Seasons Langkawi Resort and Spa to Kingdom Hotel Investments for RM435mil in 2007. Kingdom Hotel is a company affiliated to Prince Alwaleed Bin Talal Bin AbdulAziz AlSaud of Saudi Arabia. The deal won his agency Best Real Estate Investment Award Asia Pacific 2008 by Real Estate Facilities and Projects (RFP) magazine of Hong Kong. This was followed by the 2008 sale of Intercontinental Hotel Hanoi to Berjaya Group for RM253mil, which clinched the Best Real Estate Transaction Award Asia Pacific 2009 from RFP. Despite having won numerous awards over the years, Previn said that being voted the Real Estate Agent at the recent inaugural MIEA National Real Estate Awards was “the most humbling so far” because he was nominated against industry peers who were equally good. “The award will spur us to aim for even higher achievements. Within the next two to three years, Zerin Properties will be opening offices in Indonesia, Thailand, Cambodia and Laos, to market Malaysian properties,” he said. What are the secrets to his success? Previn attributes a generous dose of good luck, tremendous hard work and strong team spirit. “We have stayed focused on what we aim to achieve and relentlessly seek to achieve those targets. I have been very lucky, my degree is in real estate and I’ve always enjoyed all facets of the real estate business,” he told StarBiz. Previn began his career at Jones Lang Wootton, a leading international property consultancy firm in Kuala Lumpur, in the early 1990s. There he was exposed to all aspects of the property industry, having started out in the research and consultancy department. He then ventured into the valuation department and finally his passion for sales and marketing led him to the agency department. He was then headhunted by another leading property consultancy to head the residential agency. After a short stint with Tenggara Capital Bhd as commercial manager and head of marketing and sales (property), he left in 1998 to start a new hospitality management company, Signforce Sdn Bhd. “My last position in Signforce was chief marketing officer overlooking the sales and marketing of some of the finest hotels and resorts in the region. This helped ignite my passion for the hospitality industry,” Previn said. In 2002, he opened his own real estate agency. “This was motivated by the need to spend more time with my family and a chance to build something meaningful,” he added. From a one-man show, his agency has grown to 17 employees in Malaysia today. In 2004, he initiated overseas expansion plans and opened offices in Singapore, Sydney and New Delhi. Currently, the corporate mergers and acquisitions (M&A) portfolio contribute about 50% of the agency’s total fees, followed by residential property and office leasing which comprise 25% each. According to Previn, the agency has always been focused on corporate and residental sectors. “We now have a strong private wealth division that caters to mostly friends and families for their private investments. The M&A department is divided into office leasing, development and investments,” he said. Going forward, Previn sees the agency growing into a boutique real estate investment house catering to corporate real estate M&A and private wealth real estate. UEM Group Bhd will continue with its restructuring programme to ultimately focus on its three core areas of construction, property and expressways, its chairman said. The diversified government-owned company plans to restructure certain businesses internally or sell them to existing management or interested third parties like other government-linked companies (GLCs). "We will dispose and use the money to develop other core areas," chairman Tan Sri Dr Ahmad Tajuddin Ali told Business Times in an interview in Kuala Lumpur. UEM Group is wholly owned by Khazanah Nasional Bhd, a government investment arm. It has more than 40 operating companies with total assets of about RM29 billion. 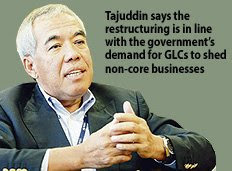 The business restructuring started about two years ago, Tajuddin said, and is also in line with the government's demand for GLCs to shed non-core businesses. "It is about making sure that each operating unit is focused and properly structured in order to be competitive. "It is about the right people owning the right thing and doing the right thing," he said. UEM Group's construction arm is UEM Builders Bhd, which was taken private last year, while UEM Land Holdings Bhd is its property flagship developing the Nusajaya township that is part of Iskandar Malaysia, a special economic zone. PLUS Expressways Bhd is the toll highway business. "Using that, we should go abroad to get the real contributor to the economy," Tajuddin said. It plans to streamline existing businesses. This has already started with the transfer of two highways, Elite and Linkedua, to PLUS from UEM Group for RM866 million. Another toll concession is the Penang Bridge, which sits under UEM Builders; ideally, it should also end up under PLUS. UEM Group also has interests in the healthcare business through pharmaceutical manufacturer Pharmaniaga Bhd and support services provider Faber Group Bhd. Tajuddin, stressing there had yet to be a concrete plan, said that, for instance, a bigger healthcare group could be created if the healthcare businesses of UEM Group and Khazanah were combined. Khazanah owns hospital operator Pantai Holdings Bhd, part of Singapore firm Parkway Holdings Ltd, and part of India's Apollo. However, Tajuddin said the restructuring will be done carefully. "We're dealing with livelihoods. There are employees. Doing this should improve their career and opportunities," he said.